There was a certain amount of consternation, both in the Shanghaiist offices and among our readership, when we reported on the findings of the World Values Survey, highlighted by the WaPo’s Max Fisher, that 71.8 percent of Hong Kongers ‘would not want a neighbor of a different race’. It turns out that scepticism was well deserved, as the original findings were based on a mistranslation when the survey of Hong Kong residents, carried out in Chinese, was combined with the broader World Values Survey in English. One potential problem with this servery database is serious mistranslation, when a survey was conducted in local language and then someone made one careless mistake when translating it. So it looks like 78.1% of people in Hong Kong dislike other races, as you say “astonishingly high.” But don’t you find it more unbelievable that the next two questions say 80% people don’t mind having drunks or emotionally unstable peoples as neighbors? Or even more crazy stuff on the next page, which say 90% people think it’s fine to have drug addicts as neighbors? i.e. the answers are not “mention” or “no mention”, or “yes/no”, or “check 1 if applicable”. The correct result should be: In Hong Kong 78.1% found it acceptable to have different race neighbours, while less than 20% found it acceptable to have drunks, emotionally unstable and drug addicts as neighbours. 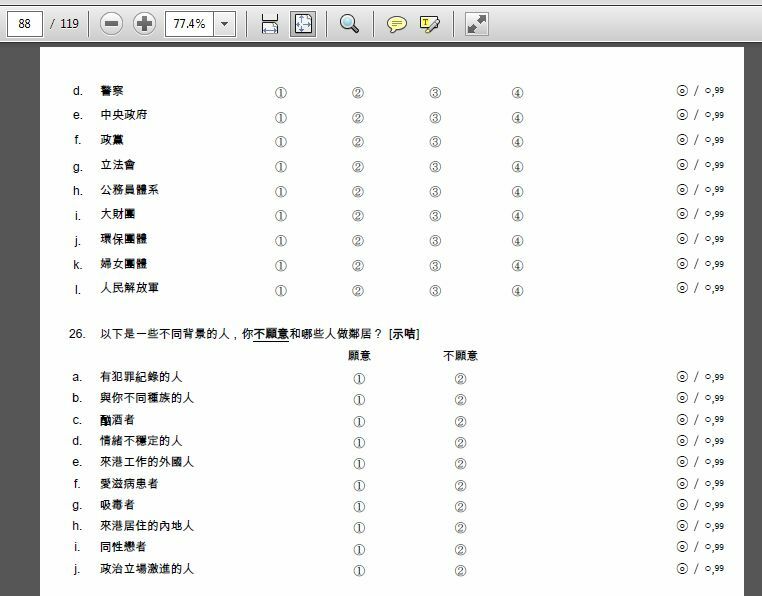 You can also contact the Hong Kong University Professor who conducted the survey (credited in the pdf). He can confirm that it was indeed a mistranslation. I wonder if the Bangladeshis number is also mistranslated. They don’t give the impression of having random racial riot every month. As Ashirul Amin at Tufts explains, the Bangladeshi results were similarly botched when combined with the main survey. Blogger Siddhartha Mitter has raised a number of concerns about the survey itself, from the comparability of data collected years apart, to a lack of consistency in the questions that were used to test intolerance (‘race’ was given several very different definitions depending on which researchers were doing the questioning). @badcanto @charlesmok I’ve been in touch with the professor who ran the survey. You’re right about the data. Correction soon, and thank you! Shanghaiist apologises for its part in spreading misinformation about Hong Kong and Bangladesh, our original coverage has been updated to reflect this.